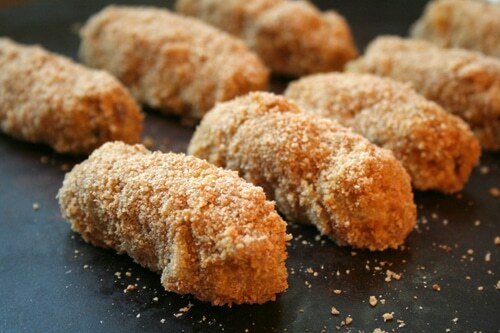 Croquetas or Croquettes are what I call “Spanish style chicken nuggets”. However, they are versatile as they can be made with different kinds of meat including fish. Adults and children love them alike which makes them a popular tapa (appetizer) throughout Spain. Croquetas make a great lunch especially for children as they not only taste great but they’re nourishing. They’re made using flour, butter and whole milk creating a thick béchamel sauce. A meat is added and after a period of rest, they are deep fried in extra virgin olive oil. Feel free to fry them up in coconut oil or farm fresh pork lard as these are also great sources of healthy saturated fats filled with vitamins and nutrients. Being a busy mama, I always make a double batch of croquetas as they can be frozen and fried in smaller quantities as you need them. Crispy on the outside and soft and creamy on the inside, croquetas are typically made after a large batch of puchero andaluz or when having made homemade beef or chicken broth. The tender extra meat is shredded and used in the filling. Next time you make homemade beef or chicken broth, save some of the meat for homemade Spanish croquetas. Your family will not be disappointed. In a cast iron or heavy bottom pan heat 1/4 cup butter. Add the onion and saute until translucent, about five minutes. Add 2 heaping tablespoons of whole wheat flour constantly stirring until browned. Add 1/2 - 3/4 cup whole milk and stir continuously until the sauce has thickened and reduced. Add another 1/2 - 3/4 cup of whole milk, a pinch of ground nutmeg and 1 tsp sea salt. Continue to stir and add 2 cups of your shredded meat or fish. 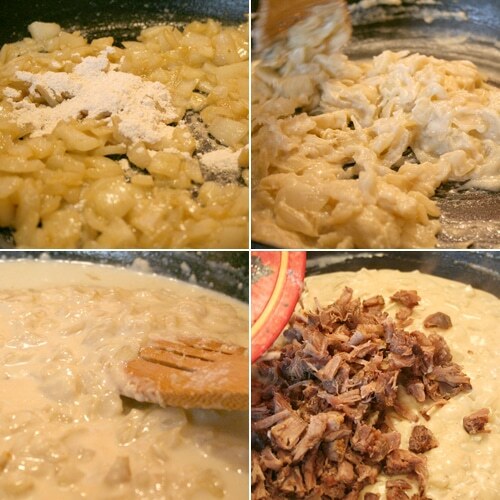 You are making a thick béchamel sauce which simply means milk thickened with flour and butter. It should be thick enough that the sauce easily pulls away from the bottom of the pan. This is very important as we are going to be molding the bechamel sauce to make our croquetas. Once the mixture has thickened, place in a bowl and refrigerate for at least 3 hours or preferably overnight. After the mixture has rested and cooled roll a cylinder shape with your hands. 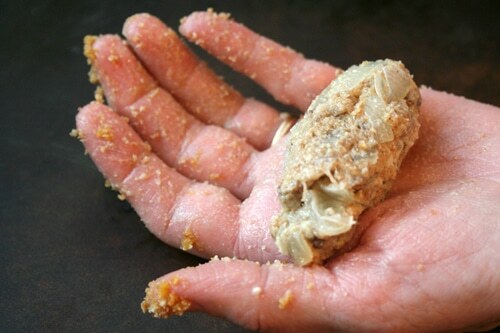 Tip: if the mixture is sticking to your hands, dampen them with water. Roll the cylinder in in the eggs then in the breadcrumbs. Set aside and repeat with the remaining mixture. At this point you can freeze the croquetas on a cookie sheet or baking stone and fry them later. Fry the croquetas in extra virgin olive oil until browned on all sides. About 2 to 3 minutes per side. As great as these taste piping hot, they’re even better the next day warmed up. Buen Provecho! What are your favorite lunchtime nourishing recipes? Wow; these look fantastic! And I LOVE (love!) that they are freezer-worthy! Makes lunch and dinner time a snap! Trying these soon. I like sandwiches with some fruit and/or veggies on the side for lunch. I know, it’s normal and not very exciting, but it works for me. I love croquetas! My favorites are made with ham, but cod makes a close second. Ham are my favorite to! Jamon Serrano, so good!! 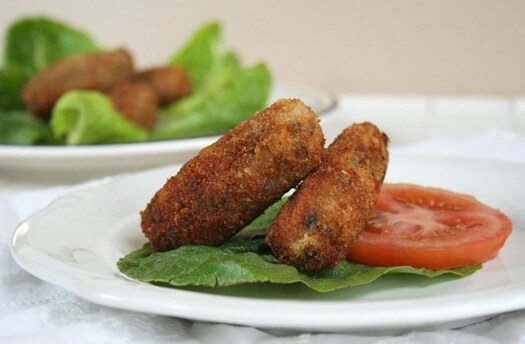 I adore Spanish croquetas – can’t wait to try these! Quick, embarrassing question, though. Are these “deep fried” or pan fried in olive oil? I rarely ever fry anything and have been known to deep fry things that weren’t supposed to be deep fried but rather pan fried. Thank you so much – can’t wait to try them! OH yum!!! Bookmarking these….these sound really good! Maybe also with a bit of cheese mixed in. I’m sure my kids will eat these up! Tasty! 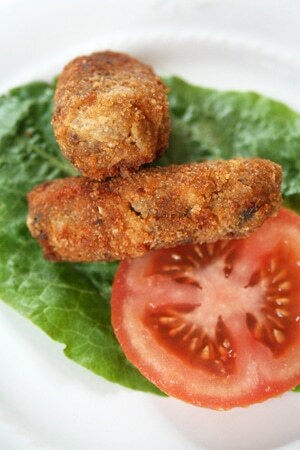 We love potato croquettes as my husband is of a Dutch background, and they were popular in his home growing up. We even own a croquette maker! I should try this recipe though with meat. I especially love the idea of freezing them. What a great quick snack! 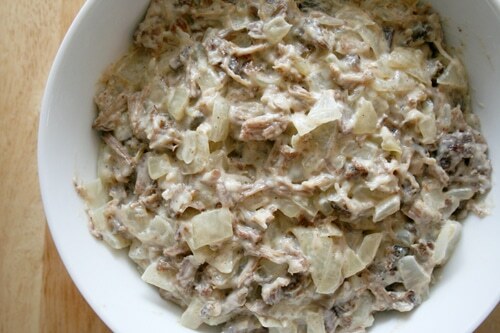 I’ve never made them but I sure enjoy eating, especially those made from bacalao. I’ll give these a try. At my place, “croquetas” were usually made out of leftover white rice. I just love recipes that can be prepared and frozen and this looks like a real winner. I’ll bet my grandkids would love these tasty treats, too. Do you think these would work using canned salmon? I’m trying to get more salmon in our diet, but my kids haven’t liked salmon patties or salmon chowder. Kathy, you can definitely try it, however, salmon has such a distinct flavor that they may turn their nose. Cod, however, works really well in croquetas and kids love them. Those look great. I love that they are freezer friendly. I want to start making more things ahead and have them ready to pull out for a busy day. Thanks. I love making these! I’ve never thought of freezing them though. Do you fry them frozen? I make Croquetas for my mother about once a month or so and her fave that I make is with schrimp and thai bird chilies. This is a great recipe that you have, I did not think anyone made these anymore. Simple, Thanks! Basque croquettas are very similar, can’t wait to make them. Usually I eat croquette with hot chili pepper. Probably its sound strange but Asian cant eat without hot chili. Delicious.